I love brunch so much! I love it EVEN MORE when I can share this awesome meal with people I love. I met both Erin and her boyfriend, JBJ, during my trip to Santiago, Chile during spring break. Since I've returned from the trip, I've had the opportunity to get to know them better and it has been lovely. I suggested going to brunch and Erin picked a great spot: Commerce (http://www.commercerestaurant.com/). I heard good things about this West Village spot but had yet to check it out, so, naturally, I was excited. On my walk, I loved seeing all of the blooming flowers. It has gotten chilly again recently, but hopefully it was warm up soon! 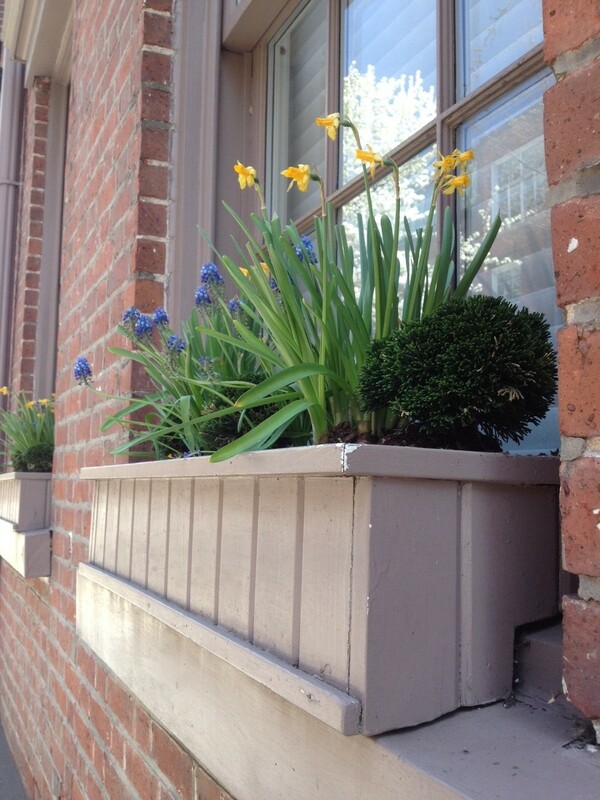 Love the window box flowers! I'm glad we had a reservation! The place was PACKED with eager brunch go-ers in their Easter best! I spotted a couple people in seersucker (oh my). I read on Yelp! that the pecan cinnamon rolls were a must order item! We ordered it and split it as an appetizer. Can't you just taste it now? DELICIOUSNESS! I ordered a Bloody Mary, because, it was brunch and that is what you do at brunch. Our server "warned" me that their Bloody Mary is "very different" and I was a bit hesitant, but I ordered it anyway. It was good though it had a strong horseradish presence. Also, one of the garnishes was chorizo. Although it was very tasty, I am still on the fence about meat products served in beverages. I love bacon but still not 100% convinced I need it in my cocktail as well. For my entree, I ordered the short rib ravioli with hen of the woods mushrooms and Barolo. This was delicious! Nom nom! Get in my belly ravioli! Although this pasta dish was nearly $30 (Easter pricing hike from $22), I felt it was the best value dish from what we ordered. It was a large serving - sometimes you order ravioli and get four. Also, the flavor of the beef was delicious! Erin ordered the Shakshuka, a baked eggs dish, and JBJ got the Croque Madame. I sampled each of their dishes - I preferred the Croque Madame though the Brussels Sprouts on the side of the Shakshuka were quite nice. Overall, this is a fantastic spot and I would like to go back for a different meal! I will also attempt to go on a non-holiday to take advantage of normal (already high) prices! Loving the tulips in the West Village!